Have you ever wondered how dance started, or how the different styles of dance were developed? If so, you’re in luck! Get ready for a history lesson. DISCLAIMER: The next two posts will be only surface-level overviews of the history of some different genres, since it would take much more time and a lot longer blog post to talk in detail about all the influences on dance. Today's post includes ballet (and pointe), jazz, and tap. Come back next week to learn about some more styles! The activity of dance has been around for centuries. In the ancient civilizations (Egyptian, Greek, and Roman) dance was used for personal enjoyment as it is now, but its main purpose was for ceremonies and rituals—for display. The ceremonial, public aspect of dance remained popular throughout the years, becoming especially prominent in the European courts.... Enter ballet! Ballet originated as a spin-off of court pageantry in Italy during the Renaissance. Although there weren’t pointe shoes and tutus yet, early ballet started developing the technicality that we have today. When Catherine de Medici of Italy married a French king, she brought her love of ballet with her to France. France then adopted ballet as a performance-based art form during the reign of King Louis XIV. Ever heard of the Sun King? He LOVED ballet and was pretty good at it himself, which is why he liked to show his legs in his portraits--he wanted to show off his calf muscles! 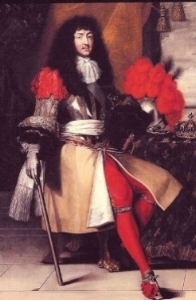 King Louis established the first Western dance institution in 1661, and since France was something of a trend-setter, other countries followed suit and ballet’s popularity spread across Europe. As an original court dance, ballet was first danced in heeled-shoes, but during the 18th century the heels were eliminated to create the flat-soled soft shoes. The first dancers to rise up on their toes actually did so with the help of a “flying machine” created by Charles Didelot in 1795. This allowed the dancers to glide across the stage, and it inspired choreographers to find a way to use pointe work in their dances. By the 19th century, dancers were able to dance on their toes without wires holding them up, and wearing only satin slippers shaped with leather! But the dancers took things into their own hands (as might anyone who was asked to dance on their toes without support) and began padding their toes and wearing a flat platform at the front of their shoe. Eventually, Anna Pavlova created the modern pointe shoe in the early 20th century by inserting toughened leather soles into her shoes for arch support and hardening the toe area to form a box. Jazz originated from native African American dance, brought to America as a result of slave trade. For the African people, their dancing was sacred, celebratory, and a way to preserve their identity and personal history. Traveling minstrels began copying the explosive, rhythmic dances in their shows, and the style grew in popularity. Like the jazz music it was danced to, jazz dance involved a lot of innovation and improvisation. For a while, “jazz dance” referred to tap, swing dancing, and many other rhythmic dances. It wasn’t until the 1950s that modern jazz eventually emerged onto Broadway, influenced by dancers like Jack Cole and Bob Fosse. Tap originated in America through the combination of several ethnic dances, such as African tribal dances, and Scottish, Irish, and English clog dances. Researchers think that it was in places like New York City, where many ethnic groups were living in close contact, surrounded by urban rhythms and sounds of machinery, that tap evolved. In the mid 19th century, the technicality of tap was very popular in the minstrel shows, but the tap shoe itself was still a work in progress. There were soft-shoes and wooden-soled shoes, but the “taps” that we know today weren’t added until roughly the 1920s. Some of the famous tappers from Broadway include Fred Astaire, his sister Adele, and Bill Robinson. Did you already know the history of ballet, jazz, and tap? What's your favorite style out of the three in today's post? Let us know in the comments below!